Jiang Rong’s best-selling novel Wolf Totem received wide acclaim since it was published in 2004. Although rights to the novel adaptation were acquired by film corporations ten years ago, the film version of Wolf Totem is finally brought to the Big Screen by French director Jean-Jacques Annaud. In order to make his 13th movie Wolf Totem without CG wolves, Jean-Jacques Annaud (Quest for Fire, Wings of Courage), who has made a career out of shooting with animals in exotic locations, had to grow wolf cubs–as he did with The Bear– over two to three years and train them to trust humans. “An important element I also realized was it was an important movie for China today and therefore an important movie for all of us today. Because global warming is something that has to be sorted out first by America and China. And China, more than America, is understanding that there is a serious problem because they can’t breathe anymore. The water, the rivers, are polluted. They have to do something and they know it. Based on a 2004 bestseller by Jiang Rong, in the film two young Beijing students are sent to live among the nomadic herdsmen of Inner Mongolia, and to teach them, instead learning about the wolf population, which is under threat by a government apparatchik. Annaud shows the fragile balance between encroaching civilization from the south and marauding wolves to the north, as wise environmentally friendly traditions give way to destructive corruption, ignorance and greed. In 1976, Annaud won the foreign Oscar for France for Africa-set Black and White in Color, which brought him as a young man to Cameroon, so he understood this story of city dwellers discovering a strange landscape. China submitted this film shot in Mandarin and Mongolian, even though, ironically, China still bans Annaud’s films Seven Years in Tibet and The Lover – Annaud had his personal ban lifted and was hired to direct Wolf Totem. The Beijing Forbidden City Film Corporation initially sought to hire a Chinese director, but filming humans with real wolves was considered too difficult. New Zealand director Peter Jackson was approached, but production did not take place. The film was produced under China Film Group and French-based Reperage. The French director, who had worked with animals on other films, acquired a dozen wolf pups in China and had them trained for several years by Andrew Simpson, a Canadian-based animal trainer. With a production budget of US$40 million, Annaud filmed Wolf Totem in Inner Mongolia, where the book is set, for over a year. Wolf Totem is based on the 2004 Chinese semi-autobiographical novel Wolf Totem written by Lu Jiamin under the pseudonym Jiang Rong. Annaud, despite a history with China, adapted the film. In 2008, English- and French-language versions of the novel were published. Jiamin and his friends at the Beijing Forbidden City Film Corporation were familiar with Annaud’s films and approached the director for the task. By August 2009, Annaud began developing the project and scouting locations in China with Jiamin, whom he had befriended. The filmmakers acquired wolves to raise and train in preparation for filming. The director worked on the first outline with writing partner Alain Godard, who died before they finished it. Annaud brought a draft to China in mid-2012. Chinese screenwriter Lu Wei wrote the second and third drafts of the screenplay. The draft was translated to French for Annaud to give feedback, and it was subsequently translated back to Chinese for Jiamin to revise. In 2013 Qiang became vice president of China Film Group, which now backed the film. Bill Kong, CEO of Edko Films, had joined the project in 2010. In April 2013, a co-production deal between China Film Group and Edko Films was signed at the Beijing Film Market. Actors William Feng Shaofeng and Shawn Dou were cast in the leading roles. The film marked the first Chinese production by a non-Chinese director. For filming, 420 Chinese and seven French crew members were hired. Annaud filmed Wolf Totem in Inner Mongolia, the region of China where the book is set, near the town of Wulugai. Filming in Inner Mongolia lasted for over a year. Annaud and his team had to overcome harsh difficulties in the wild, such as low temperatures, extremely bad weather, [and] mosquito swarm attacks. To preserve the grasslands, Annaud had his crew walk to locations with the equipment wherever possible, avoiding use of vehicles, despite the slower process making production more costly. The director said he sometimes walked over 10 kilometers to that end. Annaud said one of the most challenging scenes was depicting a pack of wolves attacking horses during a blizzard in the middle of the night. A prop horse marked with the scent of sausage, and filmmaking grips pushed the horse away from the wolves so they would chase it. In the novel and the film, Chen Zen is sent to work on the steppes of Inner Mongolia (a region of China) during the Cultural Revolution, and a government official orders all wolves in the region to be killed. The filmmakers used real Eurasian wolves (Canis lupus lupus) for the film. Annaud had experience filming with animals in his previous films The Bear (1988) and Two Brothers (2004), working with bears and tigers respectively. He said dogs were traditionally used to depict wolves in film but that he sought to use actual wolves to show authentically their hunting method. 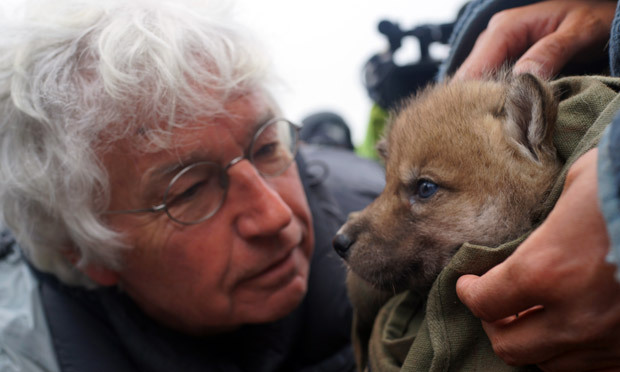 Annaud and others visited zoos around China to find wolf pups to acquire for the film. A dozen pups were acquired from a local zoo in Harbin. The filmmakers hired Scottish animal trainer Andrew Simpson to raise and train the wolves, which ultimately numbered 35. Since China has a dwindling wolf population, the government did not allow any wolves to leave. Simpson moved from his ranch in Canada to China to train the wolves to sit, snarl, and fight on cue. Four bases were built in Inner Mongolia and in Beijing for raising and training the wolves. The wolves were trained for over four years to be used in the film. Training revolved around feeding the wolves. They had a diet of dried dog food and chopped chicken, but during training, Simpson fed them “ruby red cubes” of fresh meat. The wolves were kept under control behind long, double fences and were trained not to avoid the cameras. During filming, the crew permitted the wolves to rest every hour. Despite precautions, actor Feng Shaofeng was injured by a wolf. While Annaud filmed live footage of the wolves, he used technology in post-production to create scenes that would normally be impossible to film. After filming, the wolves were ultimately relocated to Canada since they only understood commands in English. Other animals were also prepared for filming. The Mongolian gazelle was difficult to find in Inner Mongolia, so filmmakers had to travel to the neighboring country of Mongolia to acquire gazelles. French film director, screenwriter and producer Annaud is best known for directing Quest for Fire (1981), The Name of the Rose (1986), The Lover (1991), and Seven Years in Tibet (1997). Annaud has received numerous awards for his work, including four César Awards, one David di Donatello Award, and one National Academy of Cinema Award. Annaud’s first film, Black and White in Color (1976), received an Academy Award for Best Foreign Language Film. In 1986, Annaud directed The Name of the Rose, a film adaptation of Umberto Eco’s popular novel of the same name. The film version, with a screenplay written by Andrew Birkin, won two BAFTA Film Awards and was the subject of another 14 wins & two nominations. Jean-Jacques Annaud spent four years preparing for the film, traveling throughout the United States as well as Europe, searching for the perfect cast and film set locations. For Seven Years in Tibet, a film adaptation of the life of Heinrich Harrer, he reportedly received a lifelong denial of entry to China, along with starring actors Brad Pitt and David Thewlis. In 2012 however, Annaud was invited to chair the jury at the Shanghai Film Festival.